I mix my own clay and make my own glazes. 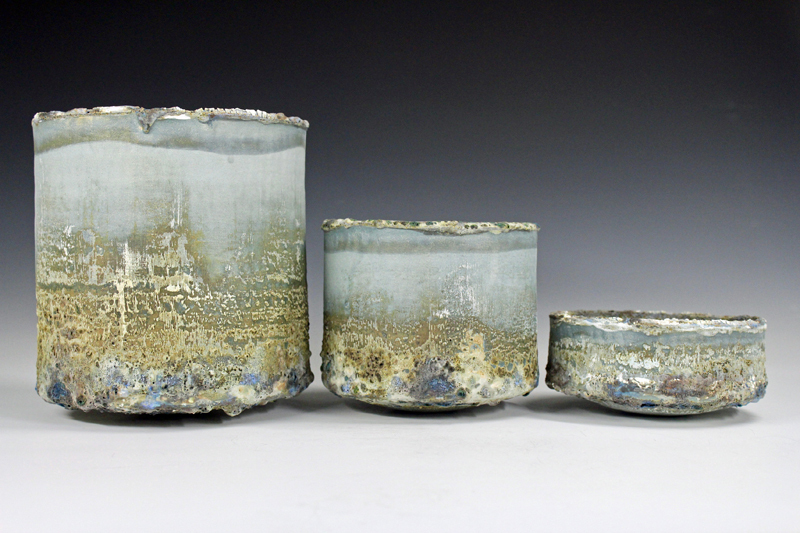 My work is thrown and fired to stoneware temperatures. 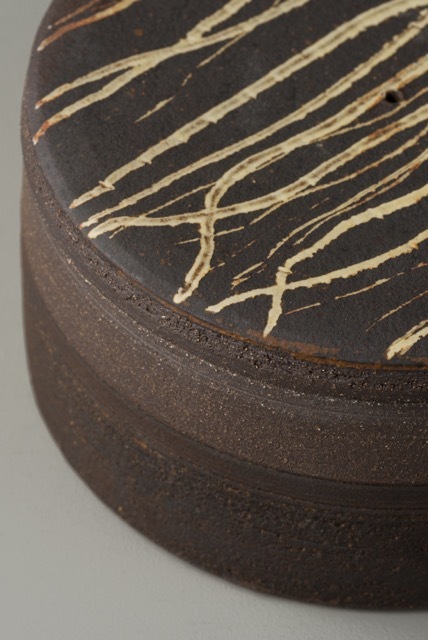 When glazing, the first marks that I make are usually with the black and all that follows is a response to that black. I use both brush and hand cut stencil and I don't know how the image will ultimately work. Pattern, colour, surface texture, all contribute to the final picture. 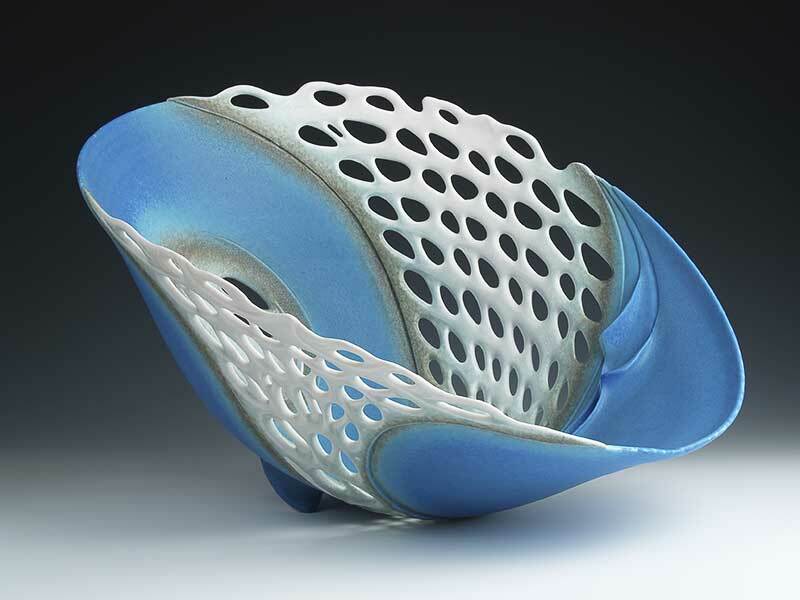 Clare works with porcelain to create ebbtide seascape vessels and sea pods from the deep. Her work has evolved over thirty years of experimenting and pushing the boundaries with ideas and techniques. She draws from the seas inexhaustible supply for inspiration. Pieces capture the effects of constant change on the environment. Smooth, eroded chalk rock pools, the constant flow of the sea and rocks hewn through to reveal inner striations of sediment and emerging life forms can all be interpreted in her work. Her addiction to all year round sea swimming inspires a feel for fluidity with euphoric storm winds whipping up big rolling, icy swells to flat calm waters reminiscent of Mediterranean summers. 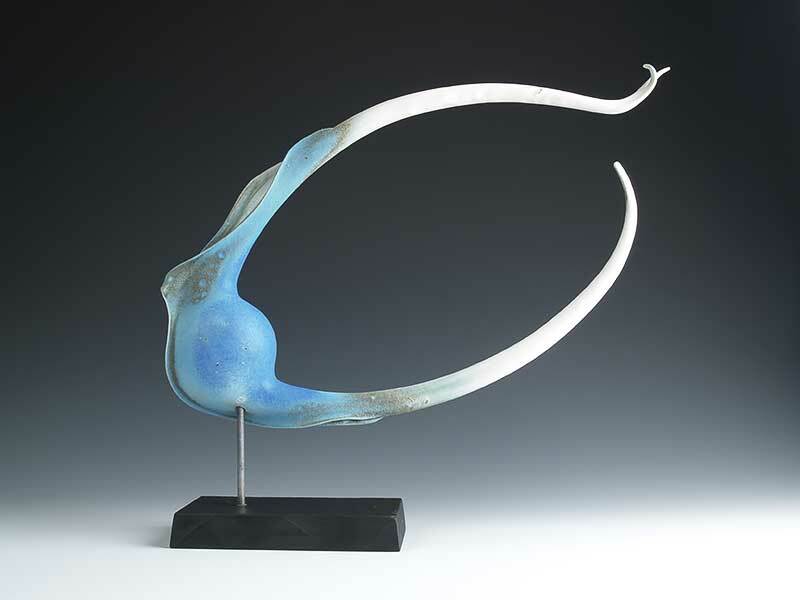 Working with Audrey Blackman porcelain, vessels are thrown, pierced and sculpted, sea pods are hand built, pierced and sculpted. Glazes are silk white, subtle greens and vibrant blues which are sprayed, painted or poured; often all three methods are used on one piece. 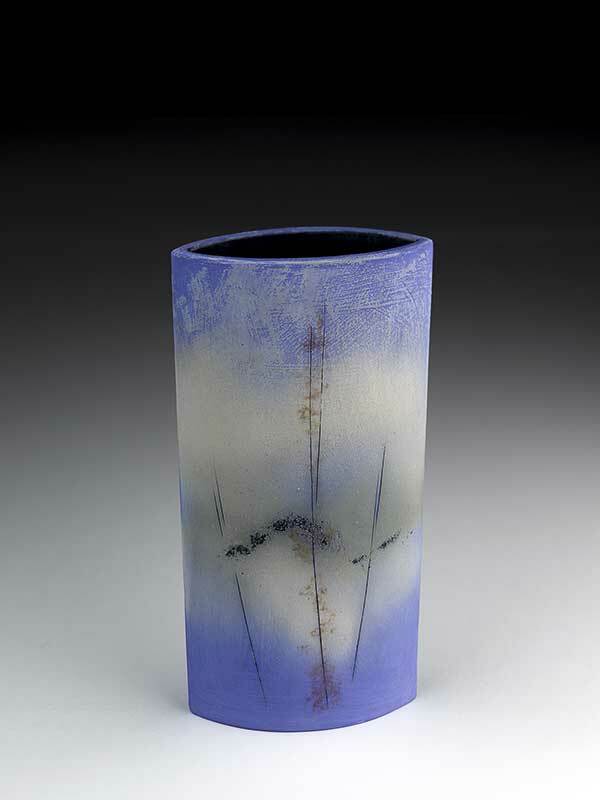 In an electric kiln, work is bisque fired to around 1000c and glaze fired to around 1240c. Clare’s workshop can be found on the South East coast and visitors are welcome by appointment. 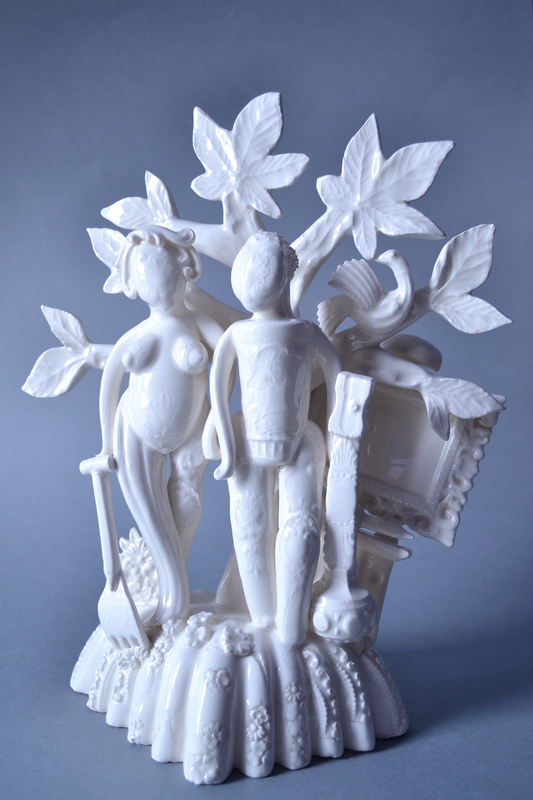 Flatback Figure Series: Recalling traditional Staffordshire mantelpiece ornaments, each of these unique ceramic figures is crafted from casts of contemporary packaging and discarded domestic ephemera, commenting upon our consumerist society. Creamware, press-moulded, individually animated elements bonded at leather hard stage. 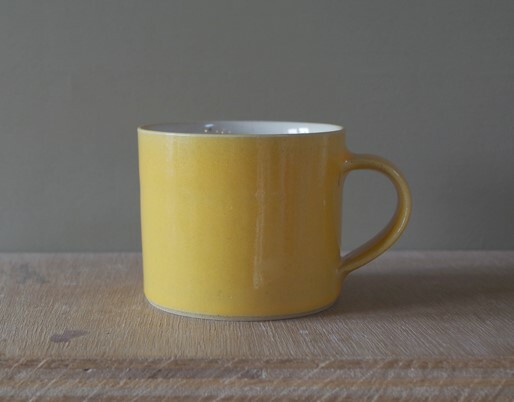 Traditional Staffordshire glazes. Rose Wallace has lived in Oxford for over forty years. 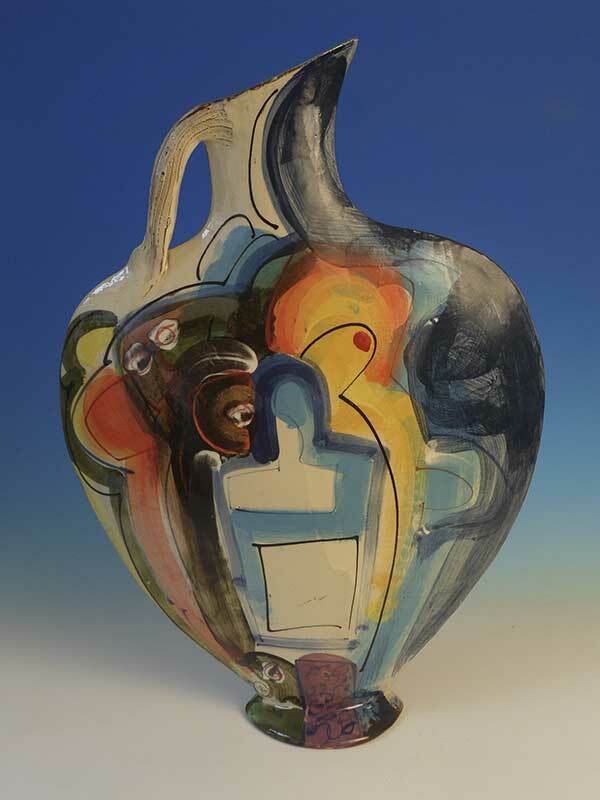 She has been involved in ceramics since 1998 graduating with a first class B.A. from B.C.U.C in 2008. 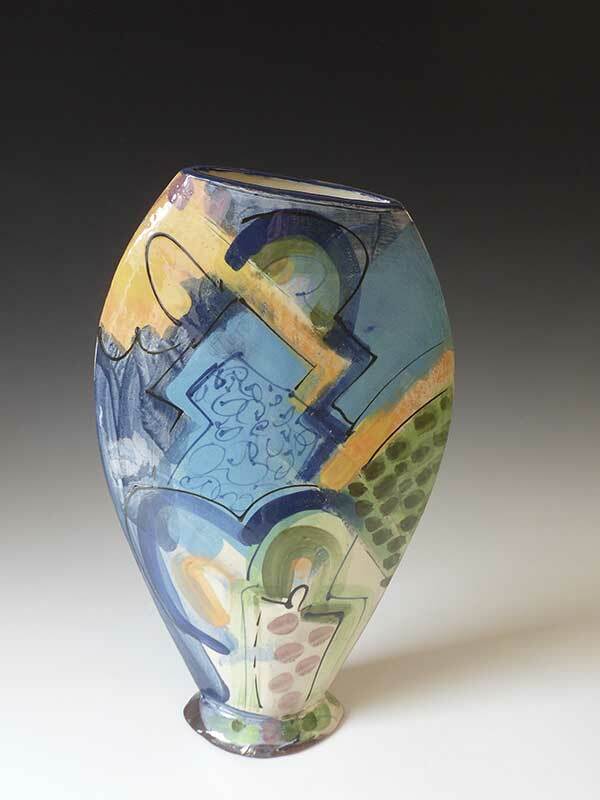 Rose was selected for professional membership of The Craft Potters’ Association in 2010. 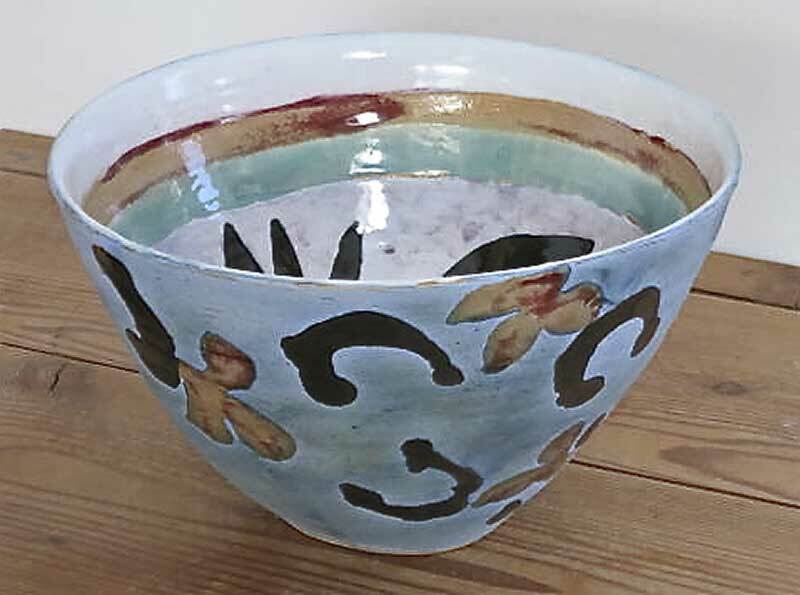 Since 2017 she has been employed as a pottery tutor for Abingdon & Witney College. Rose works from her Florence Park Studio in Oxford. Commissions and visitors welcome by appointment. 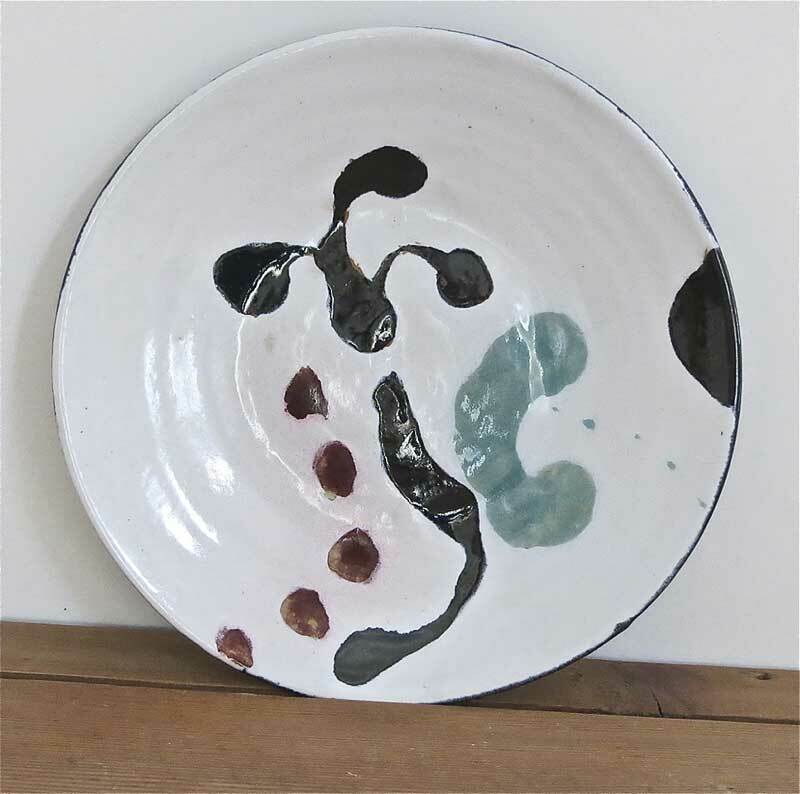 Ceramic works selected for the permanent collections of The Grimmerhus Museum, Denmark, The International Ceramic Research Centre, Denmark, The Ken Stradling Study Collection, Bristol and Cannon Hall Museum, Barnsley. 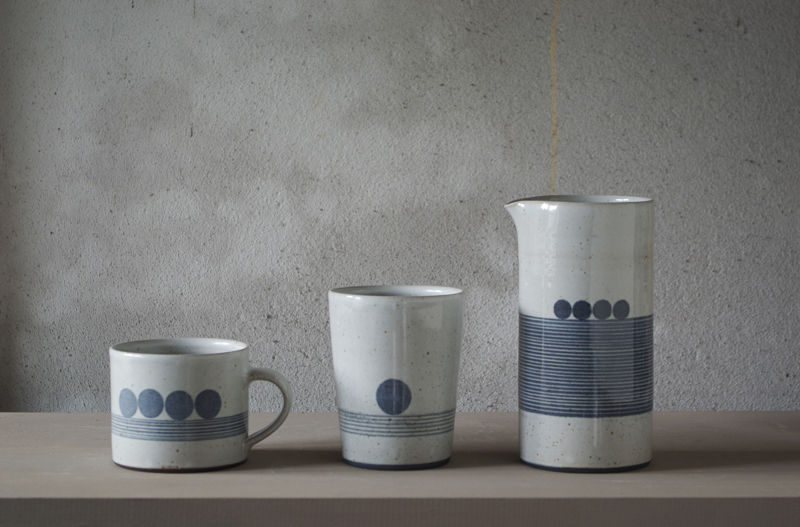 All the work is made in earthenware and decorated with combinations of paper resist and slip trailing. 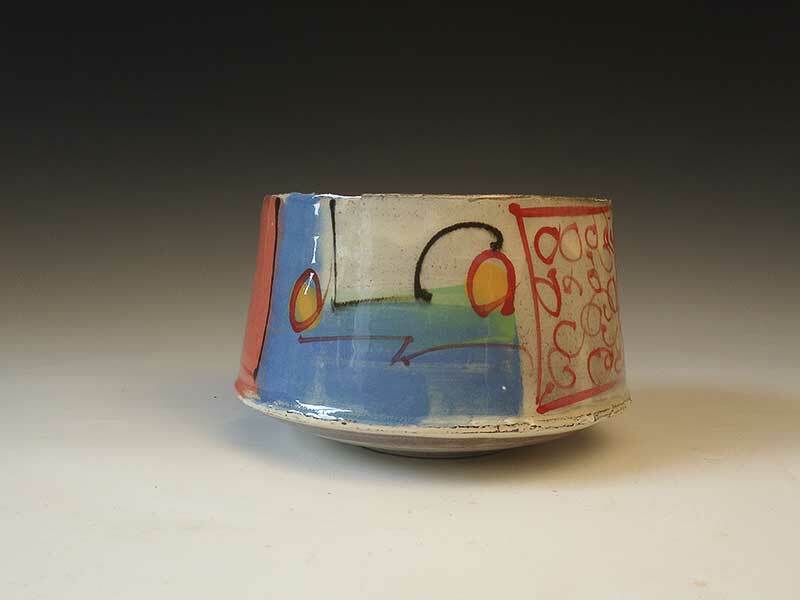 White slip is poured thinly to let the colour of the body through or used very thickly and applied whilst the pot is rotating on the wheel to give a ‘wrapped’ look. At present I am using the paper to mask an area to decorate within, which gives a greater flexibility for variation and experimentation. I also decorate with coloured glazes, again both thinly but with detail in thick, rather like applying watercolour, moving from light to dark. Recent work has been based on leaf motifs, vegetables and images of fruits, looking at the way fat pears ‘sit’ or oval lemons ‘lie’. 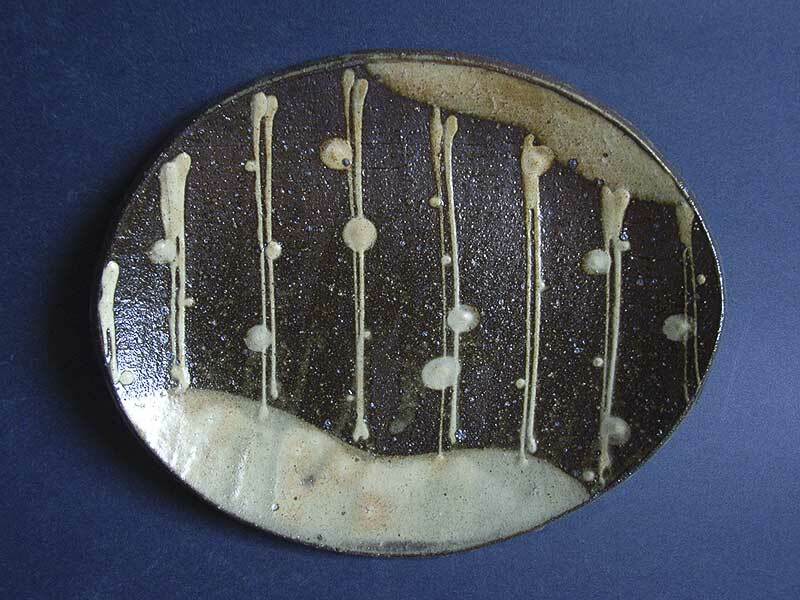 Most of the work is thrown on a momentum wheel, which I made at Chesterfield College, in the 1970s. I enjoy the relaxed rhythm and the quietness of the flywheel as it is the only way to hear Radio 4 without interference! The wheel is built to exactly accommodate my frame and is therefore extremely comfortable. 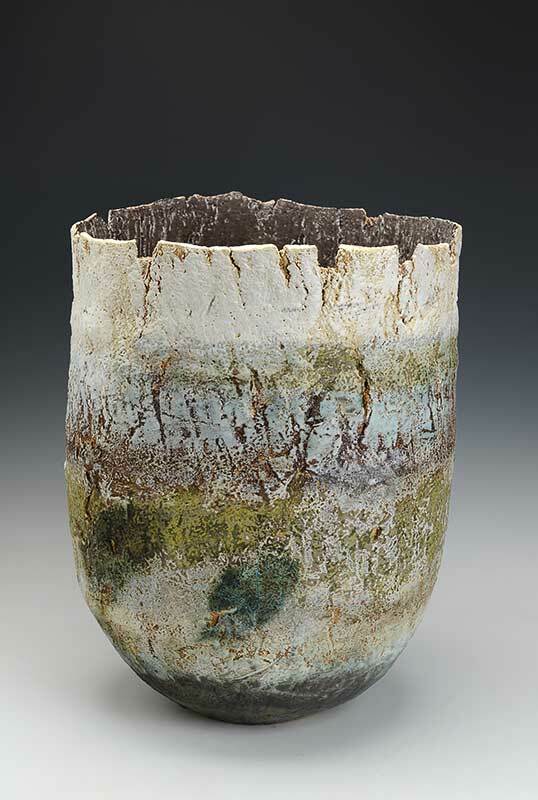 The work is raw glazed and fired to Cone 03 in an electric kiln. 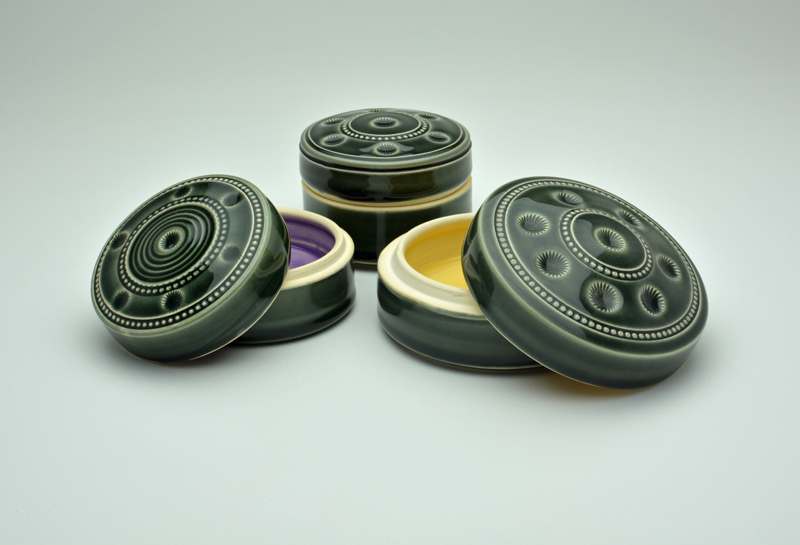 All the pots I make are functional and are made to be used in the kitchen or for serving on the table. The decorative motifs are used to complement the food cooked and served in them and provide a pot that is pleasing to the eye when not in use. 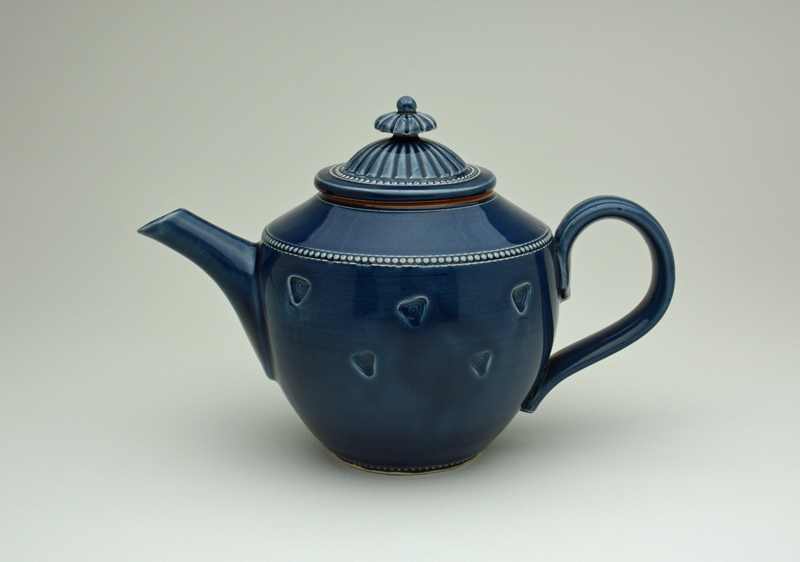 Sarah Walton has worked as a potter for 40 years. Through this time she has moved from being a maker of hand thrown tableware to being a hand builder. 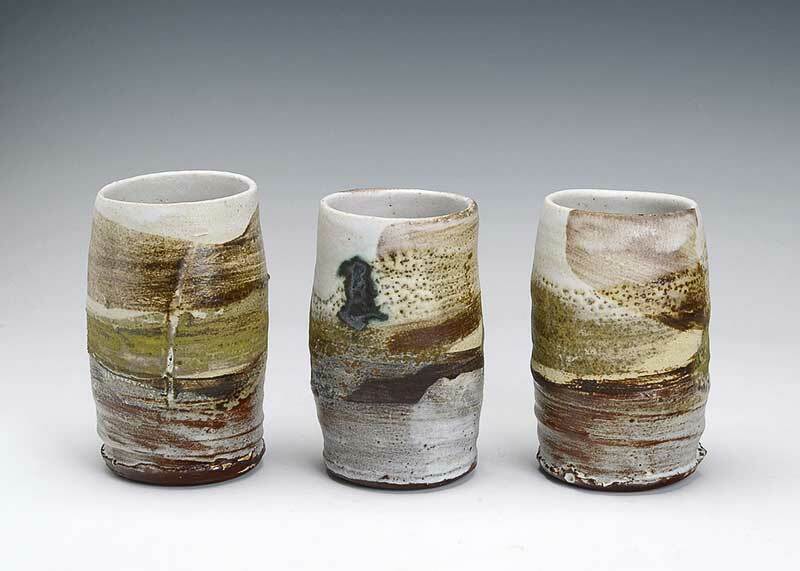 Throughout she has used stoneware clays that she has fired in a reducing salt kiln to 1280c. She is known for her birdbaths that stand on oak bases. She continues production of these while alongside developing large abstract ceramic sculpture that she hopes to make in brick clays. At the same time she is also starting to produce a range of birdbaths in cast iron. 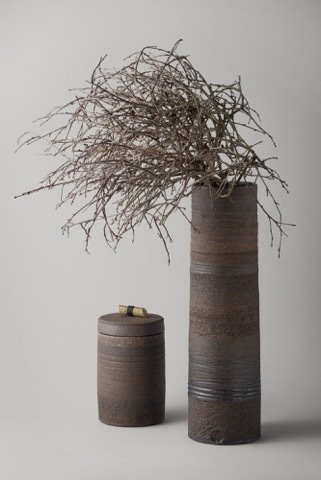 She has a constantly changing display of her work set out in a woodland setting beside her workshop in Sussex. Visitors are welcome to view this work. 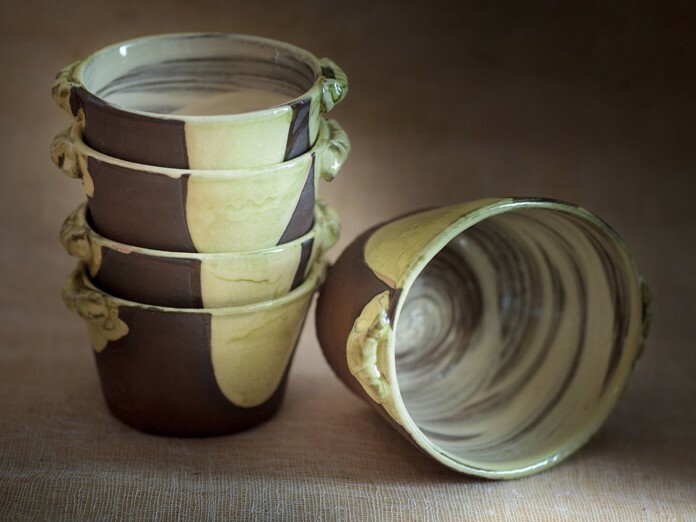 There is something compelling about the making of pots, regardless of function, which keeps me within this particular sphere; they are the focus of so many interests and associations. 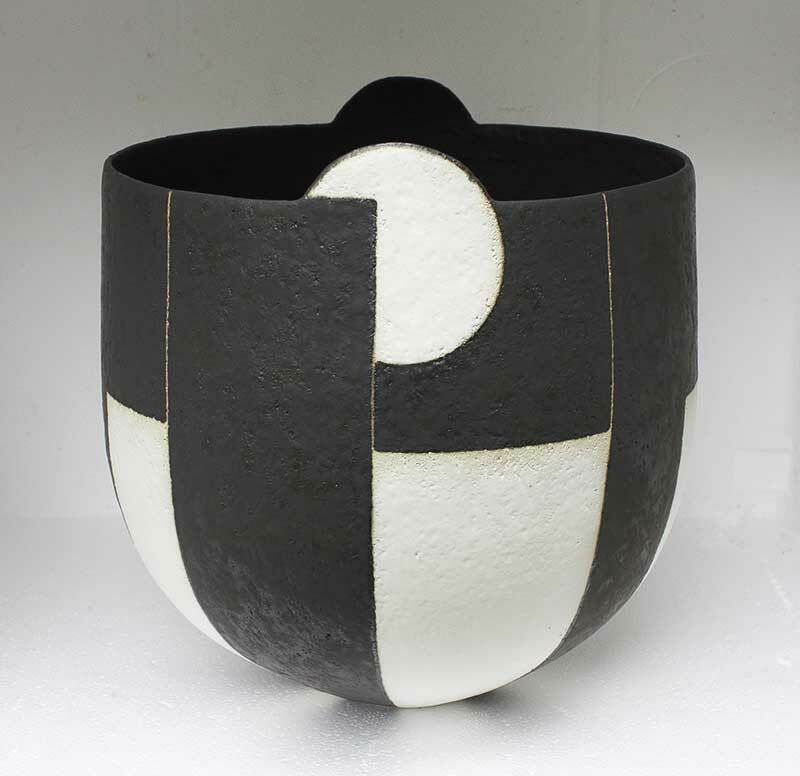 My aim is to make pots which have simple forms with integral decoration and aspects which can interact with the environment in interesting ways; to try to express a balance between these dynamic qualities and a sense of stillness or containment. All work is handbuilt by pinching out a base then adding flattened coils of clay to produce hollow forms. These are sometimes altered, at the leather-hard stage, by cutting and rejoining to create ridges or grooves between curving surfaces. Finally they are scraped and partly-burnished with a pebble. 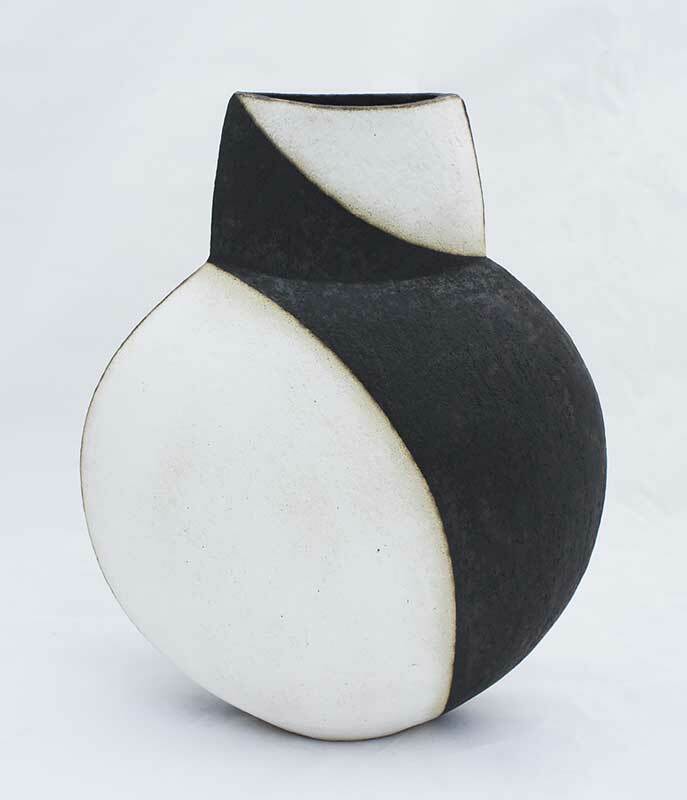 The majority of pots are twice-fired in an electric kiln; bisc-1000c, glaze-1240c. 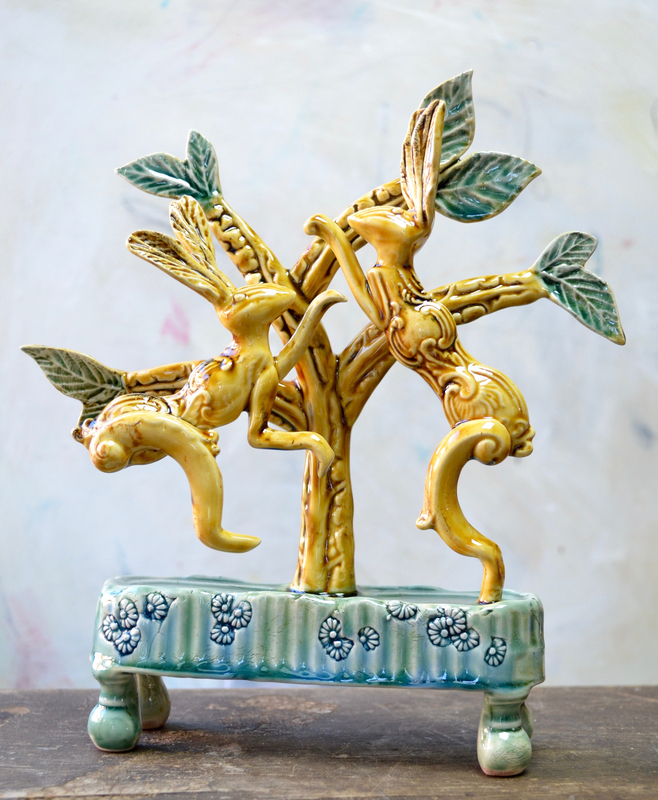 Glazes are applied by a combination of pouring, spraying and painting, sometimes with painted decoration beneath. I try to evolve form and surface treatment together in a balanced yet dynamic way using abstract decoration partly derived from the form but tempered also by external influences. 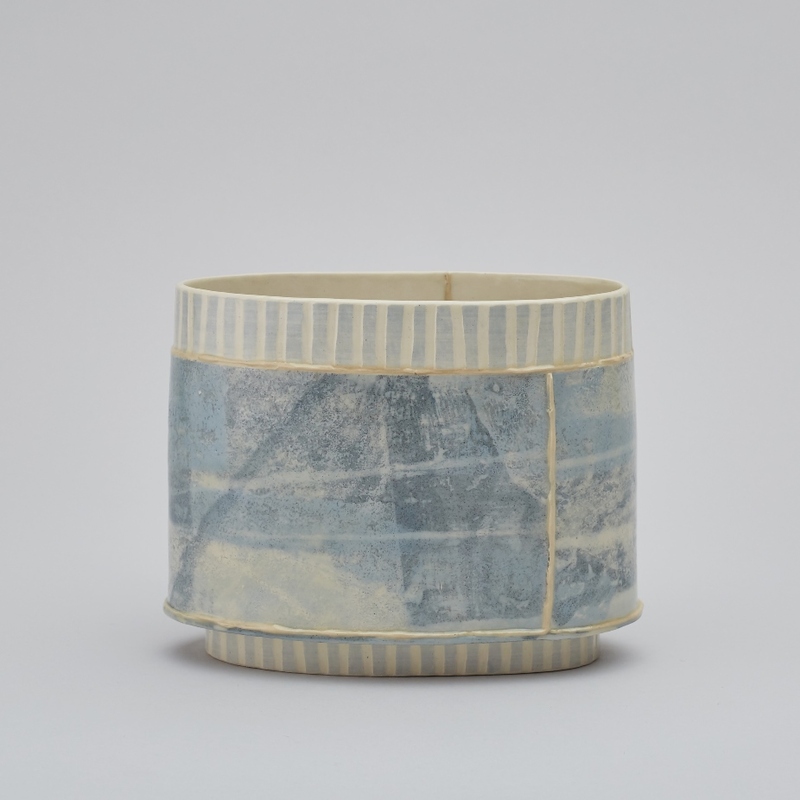 The way light falls across objects in my workroom has suggested black and white designs; the movement of water and waves and the dips and folds of strata revealed in the cliff faces on the nearby Pembrokeshire coast has affected my use of banded decoration. Colours are echoes from the landscape. Form above all, but expressed through light and colour. 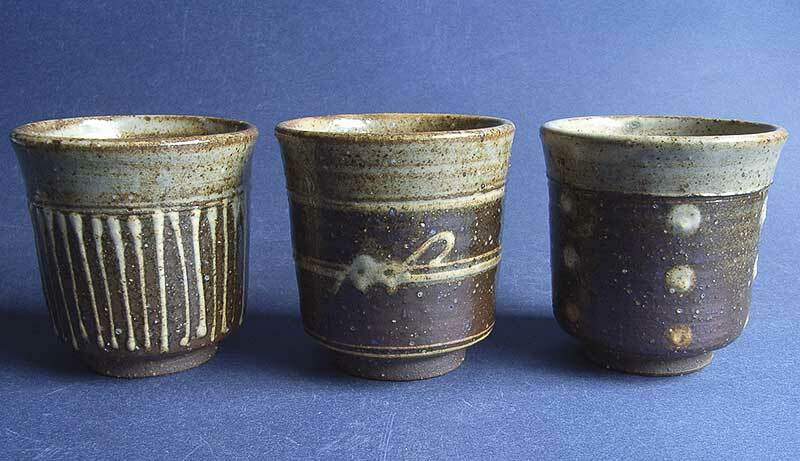 James and Tilla met each other during their apprenticeships to the potter Rupert Spira in the late nineties. In 2002 they set up their workshop in rural Carmarthenshire where they live with their three daughters. 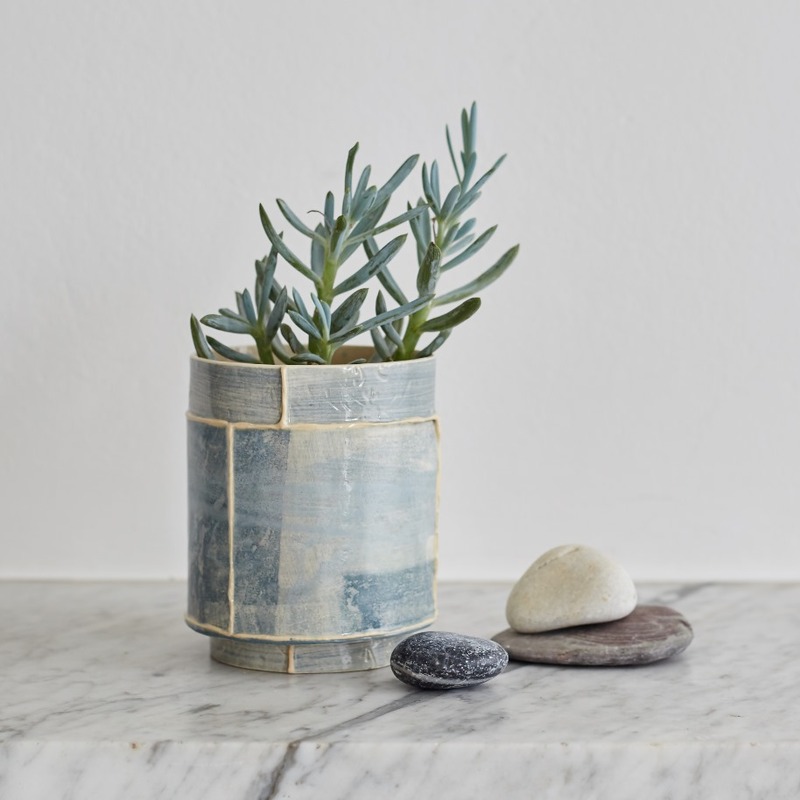 They believe passionately in the importance of functionality; merely being hand-made is not enough but when an object is well made and a joy to use it can become a cherished possession and make an enriching contribution to daily life. Their work is sold across the UK, and from their website. 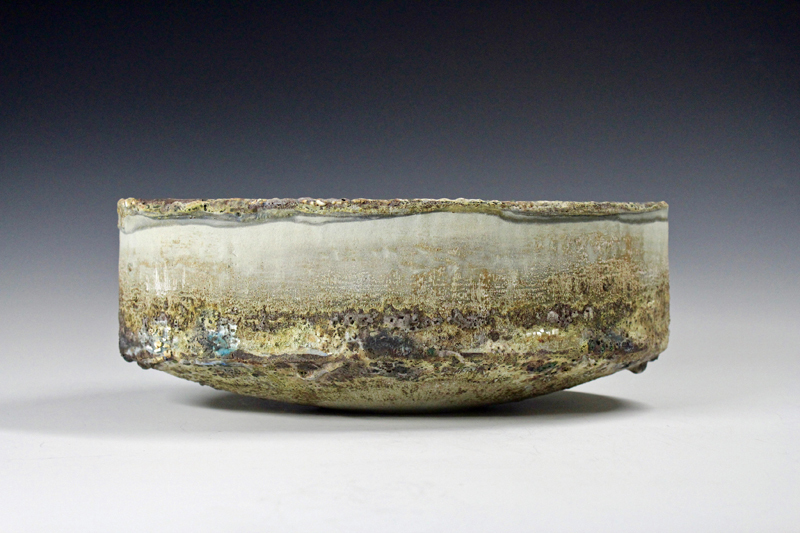 I engage with the relationship between nature and culture through the glazed surface and form of coil-built vessels. The vessel is a great symbol of civilisation and echoes the man-made and structural environment in which we live. In contrast to this, naturally occurring textures found within urban and rural environments perpetually interact and alter this order. 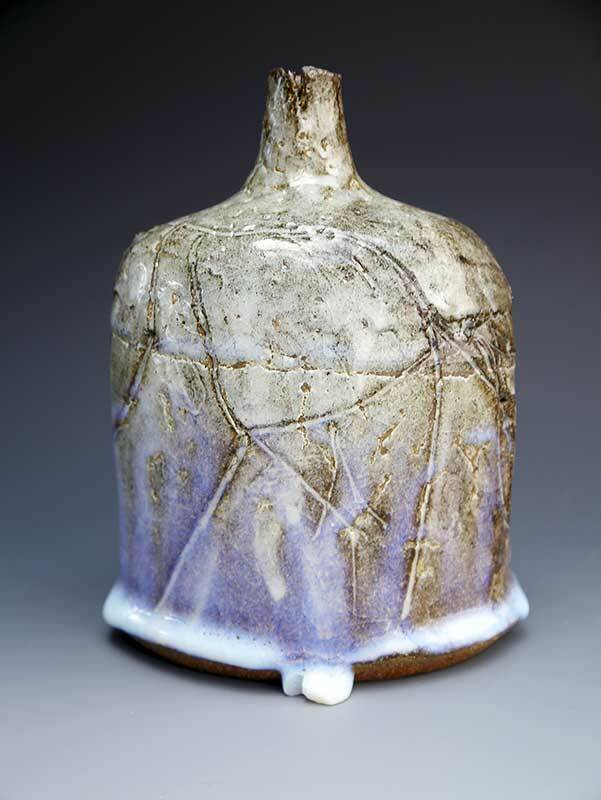 Such textures can be rendered through layered volatile and blistering glazes. 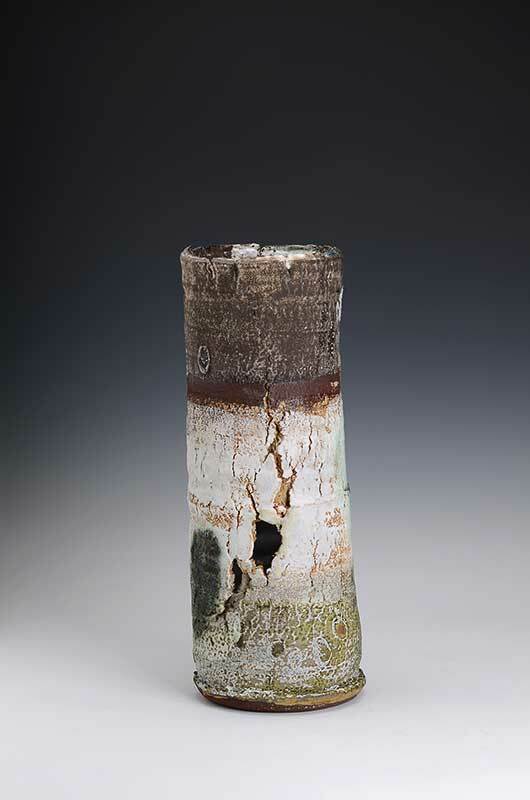 The tension between the man-made form and natural [glaze] phenomena in my work, brings into focus the nature of our materiality and fragility. 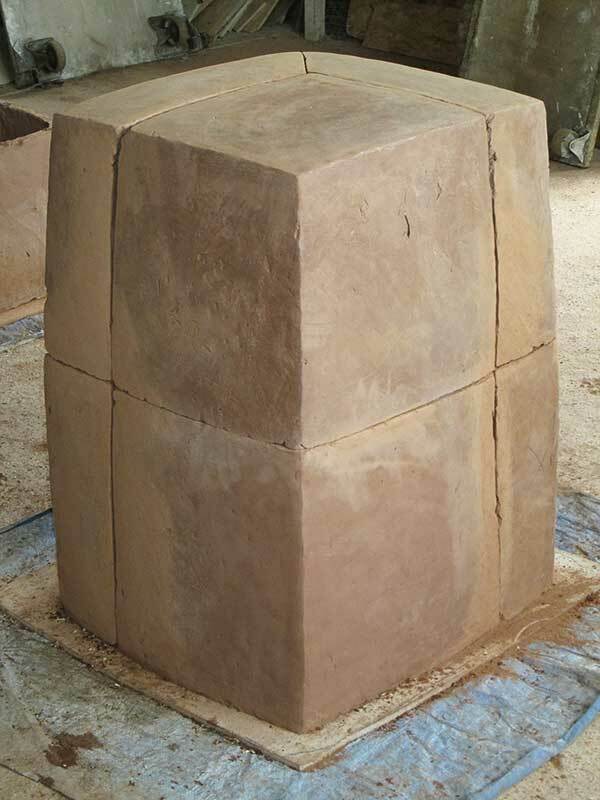 The vessels are formed first by press-moulding the base. I then coil the walls; a slower technique allowing me constant flexibility and control. 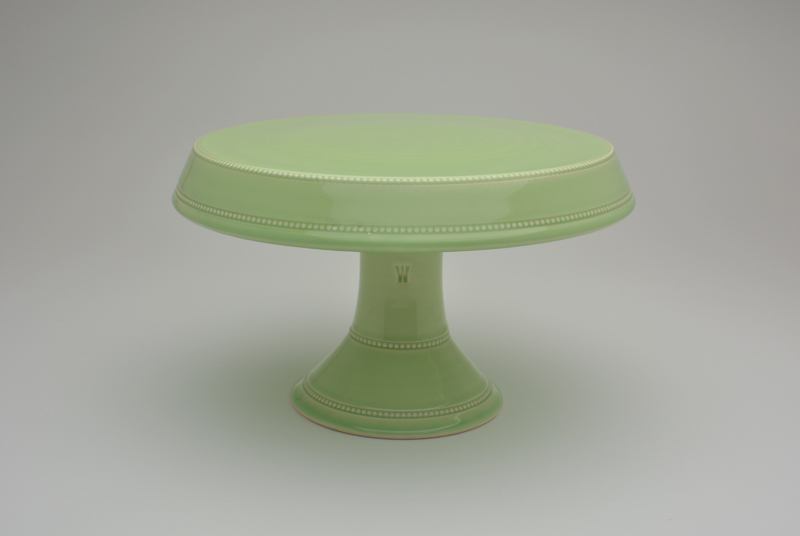 My treatment of the glazed surface renders evidence of brush marks and chemical reactions. 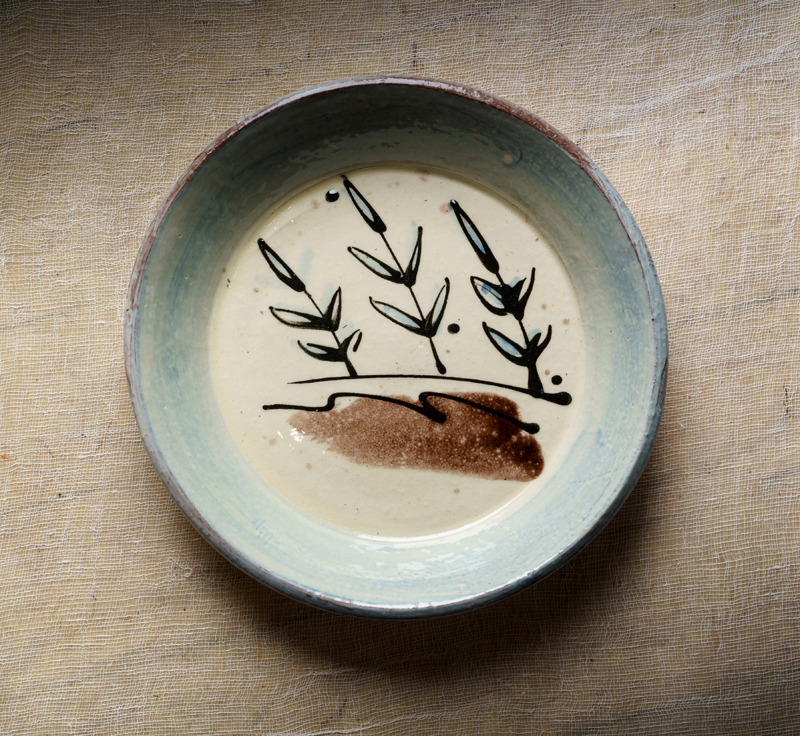 The surface is built up and transformed through layers of brushed slips and glazes. In places, layer upon layer can simultaneously build and crumble, in others, the glaze is barely present, leaving just a trace. The process begins to reveal its own language, determined in part, by chance. 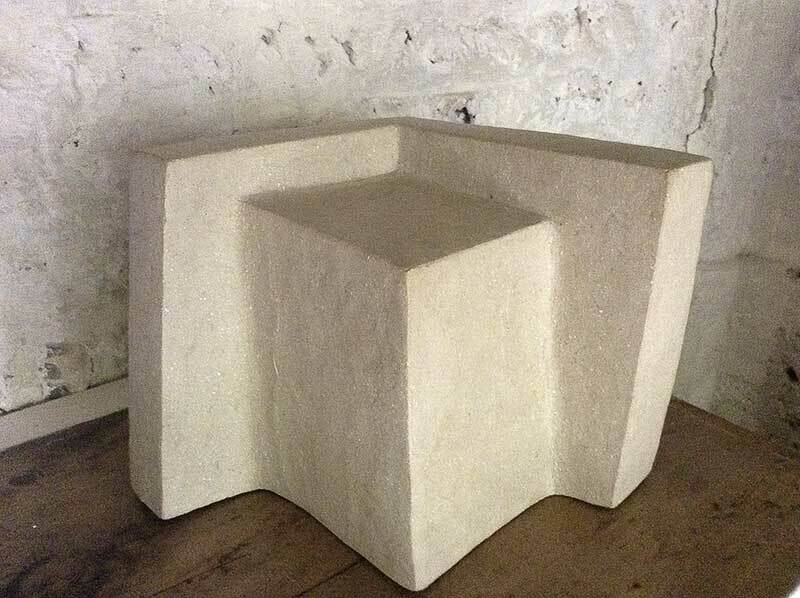 Once applied, the materials are set to react within the conditions of the firing process. I fire an electric kiln to around 1230 degrees centigrade. 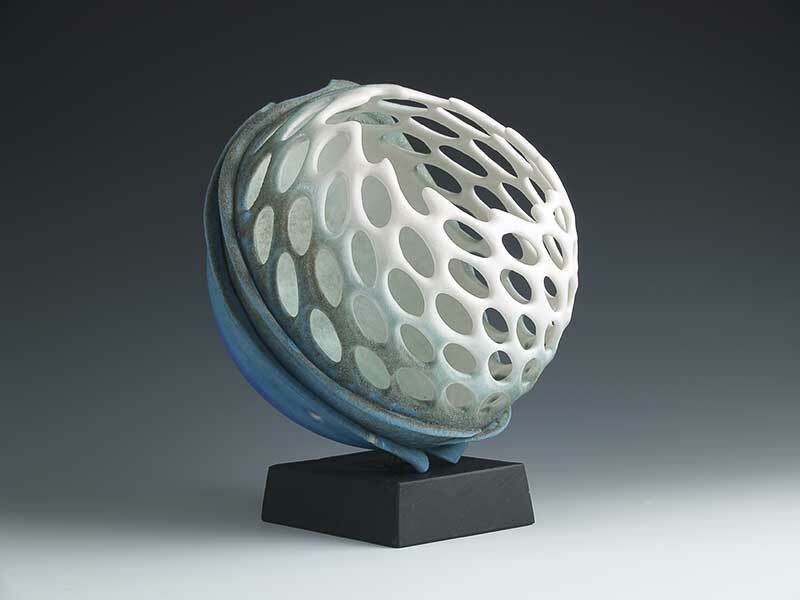 Glazing and firing processes are repeated until the optimum depth and complexity of surface appears. 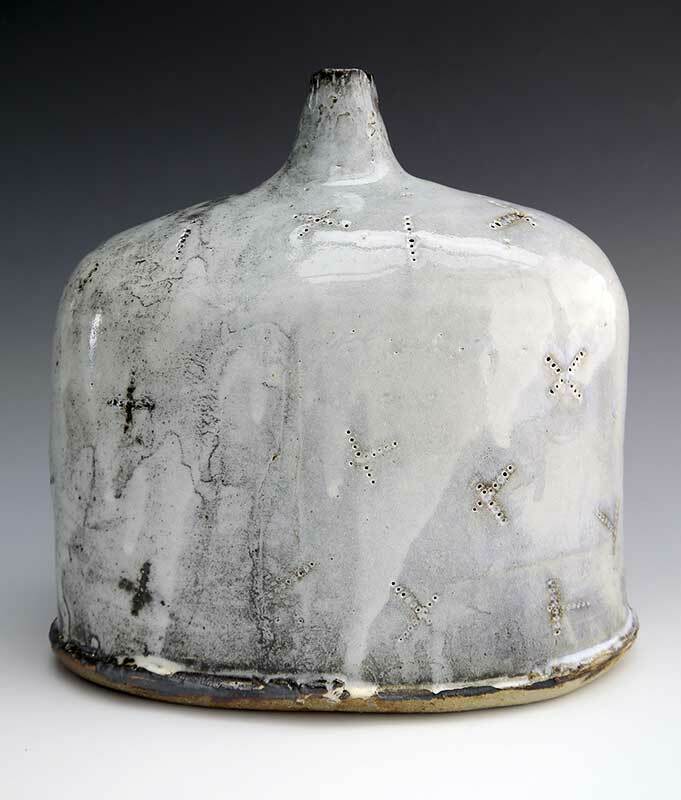 Annette Welch’s current collection of wheel-thrown, stoneware ceramics include large platters, tall vases, lidded forms and pod jars, which can be handled, used and displayed in domestic settings. 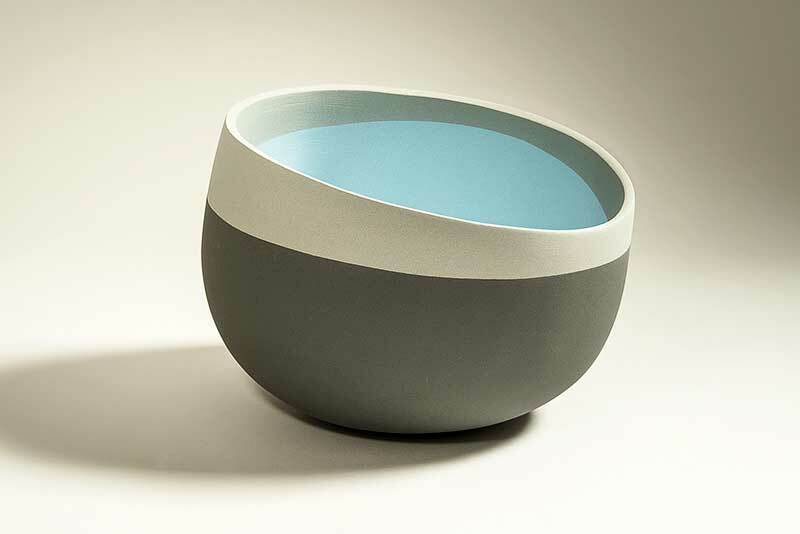 The work plays with contrasts – shadow and light, detail and restraint, coarse and smooth. 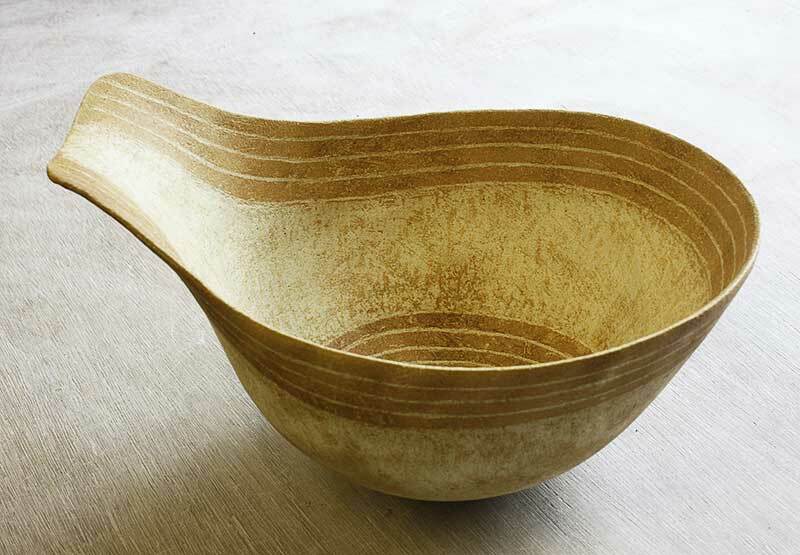 Visual and tactile qualities vary from elemental, scarred, raw-earth warmth to a light, smooth and subtle clarity. 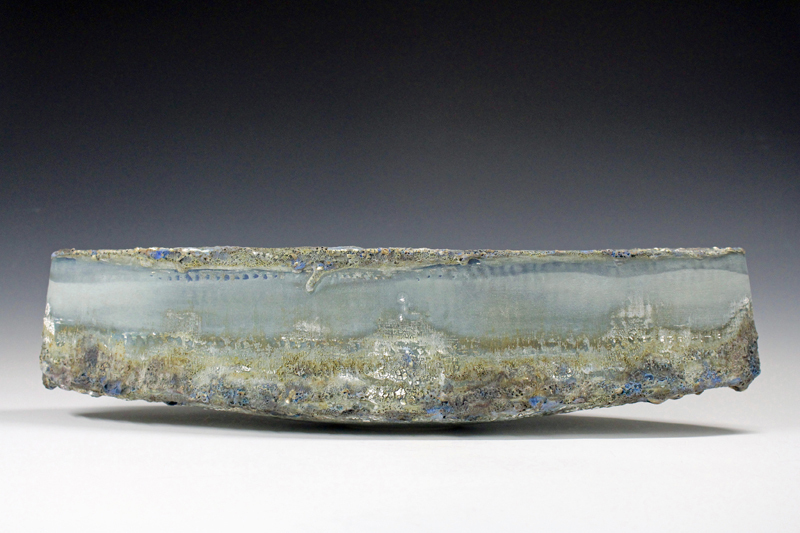 After many years of making decorative Raku I decided it was time to look afresh at what I was making and attempt to incorporate into it elements of the ceramic history I am interested in. I am throwing the pots, using press-moulds for spouts, roulettes for decoration and extrusions for handles. 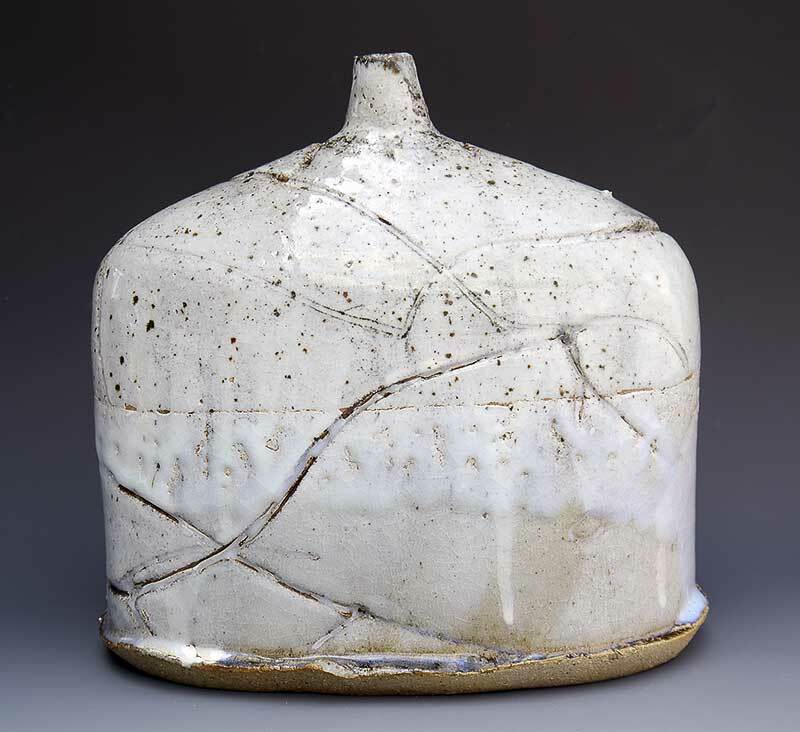 Firing is to 1090*C.
Slab built bottles, bowls, other vessel shapes, fired with gas to stoneware temperatures in my studio in North Norfolk, (some wood-fired pieces fired in Devon with Nic Collins and Sabine Nemet). 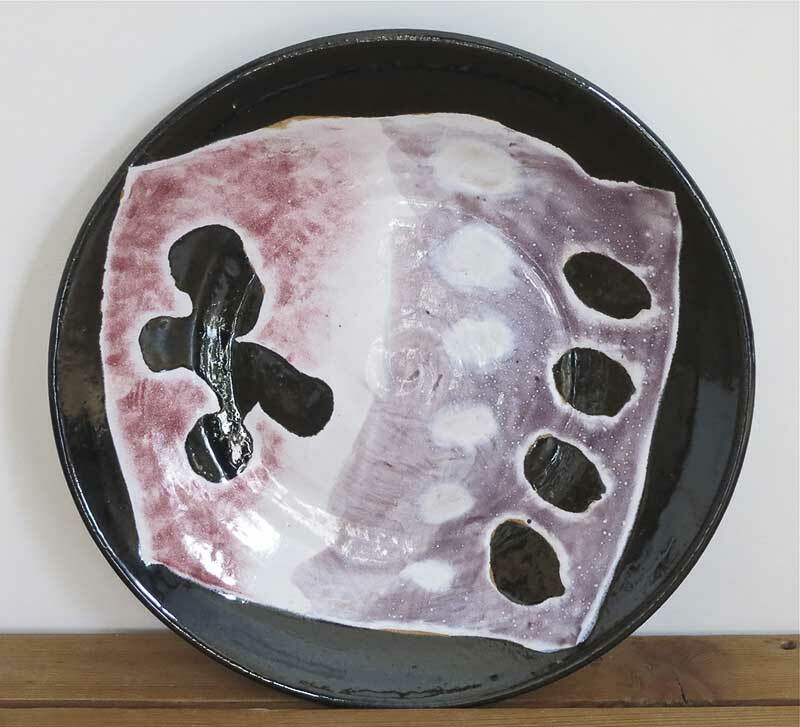 These hand-built ceramic pieces focus on surface decoration, collage and juxtaposition; where the vessel is a starting point for exploration of shape, and an interest in the sense of repair and assemblage has informed my method of construction over several years. The shapes in the collection continue to evolve, building on what came before and reaching for a pleasing sense of aesthetic and balance. 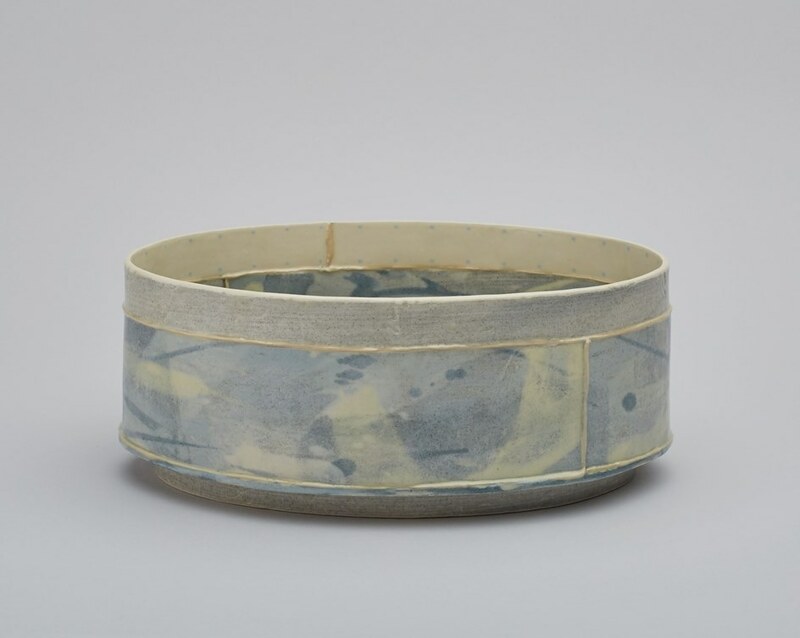 Layers of decorating slips are applied in a painterly manner to build up the surface and create a depth that holds similarities to misty skies, or walks across the hills, which in turn allows the vessels to create a sense of place. 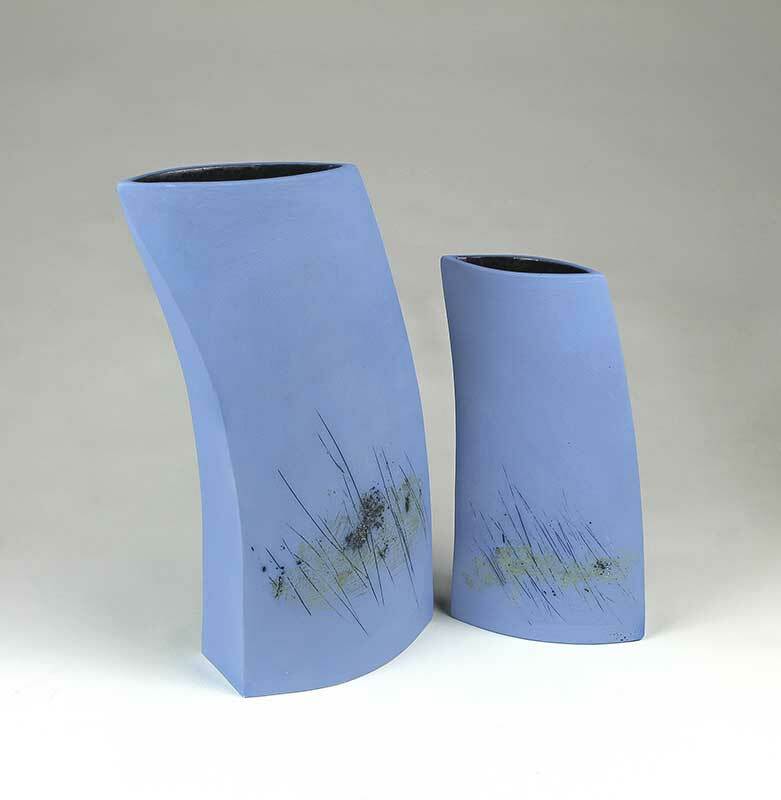 Often these pieces can evoke memories of a walk or a view across the sea adding to the notion of interpreting landscape. And so, each piece is an interpretation of an earlier impression or experience. A painting in clay. 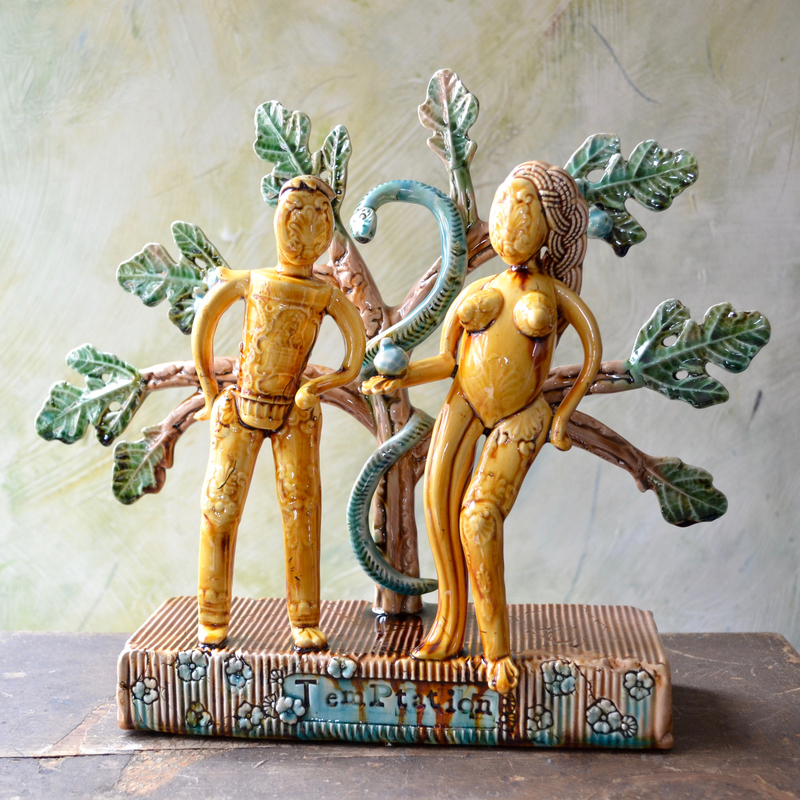 Whilst in Germany, Richard spent some time with potters whose work drew from Eastern European designs, and has himself been especially inspired by Hungarian and Romanian slipware from the 1800s. 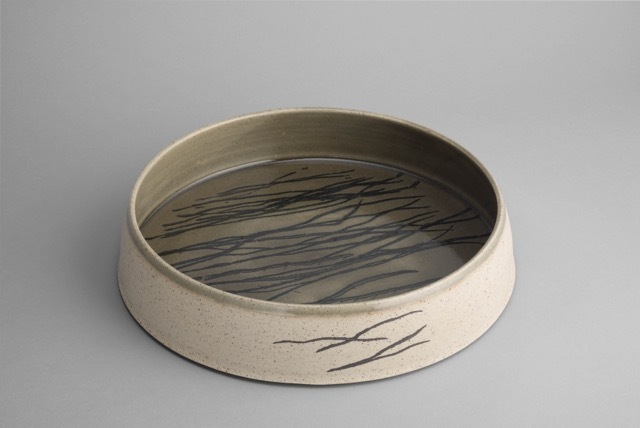 He has also been strongly influenced by the Cardew tradition of English country pottery, having spent some months working at Wenford Bridge in the 1980s, learning about the strengths and subtleties of Cardew's work. Richard's work is sold in many galleries in the UK from Scotland to Cornwall and also the Caribbean. Each piece I make is a journey which encompasses an appreciation of chance and explores the balance between colour, line and form. Inspired by the interplay of the organic and the geometric and of spontaneity and control, the pieces emerge from processes which examine the relationship between instinctive action and form. Intuitive, almost unconsidered movements allow and encourage the unexpected to develop alongside combined with precise controlled processes and movements which seek to contain. 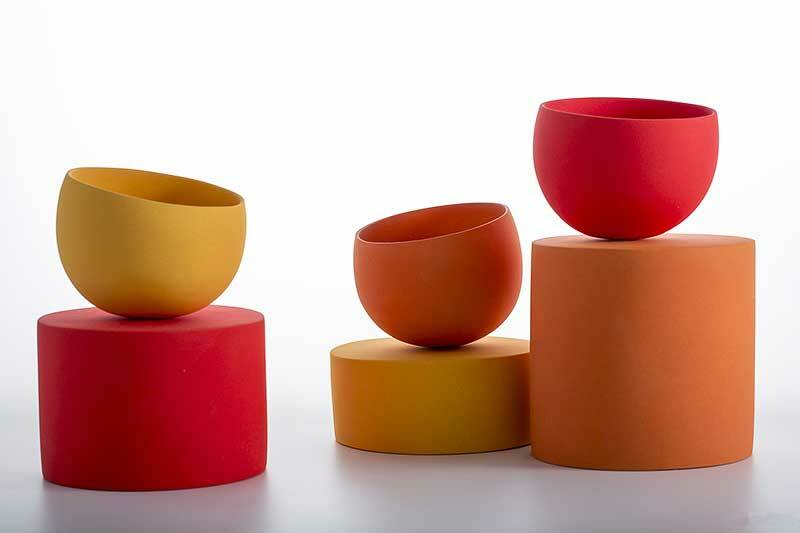 Thinking of the vessel as an abstract object I use colour to segment and define the form, the outside surface, the rim, the inside, sometimes cutting across the surfaces to follow ephemeral lines created by light and shade. 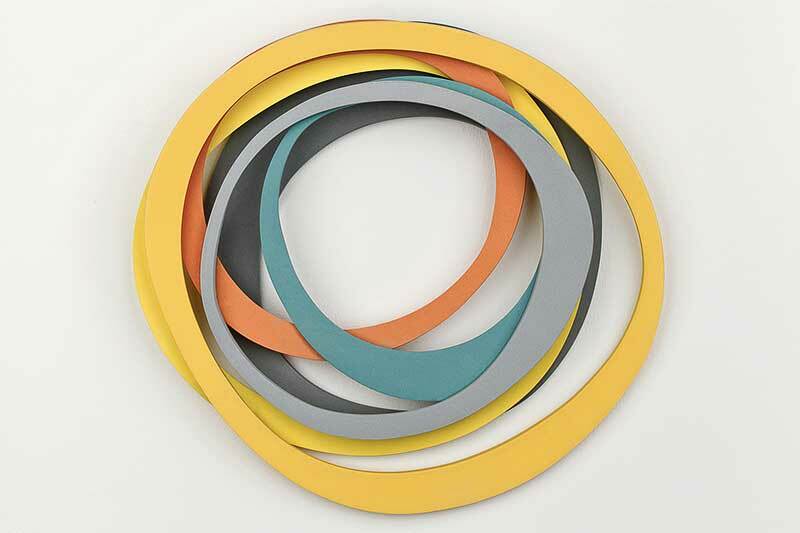 The wall pieces have developed as an abstract shifting of the lines, planes and colours found in the vessel forms, they have been re-arranged and composed to create new forms in a different dimension. 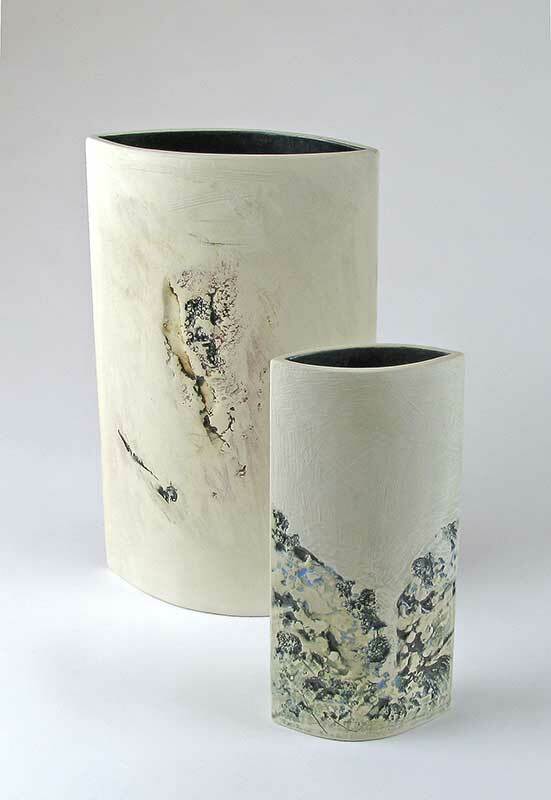 Slab built white earthenware vessels and wallpieces decorated with textural abstract drawing, using slips and glazes. Fired to 1140 centigrade in an electric kiln. Some pieces then have a minimal and controlled smoke firing. I am based in Hove East Sussex, by the sea. My workshop and display studio are in my home. I make my pots using a combination of techniques - throwing, pinching and coiling. 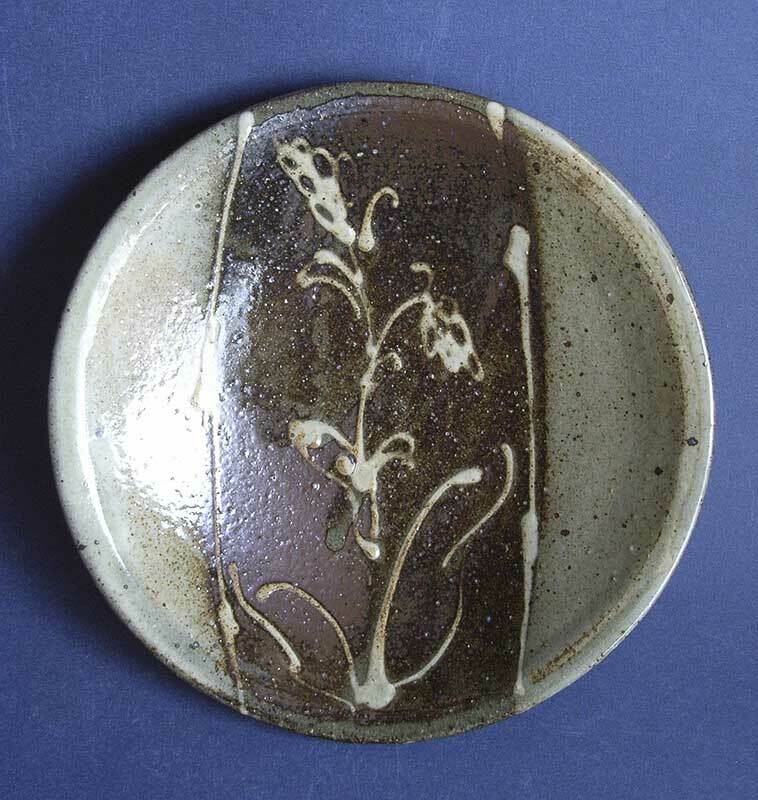 I use stoneware clay, assortment of slips and glazes, electric fired to 1260 degrees. 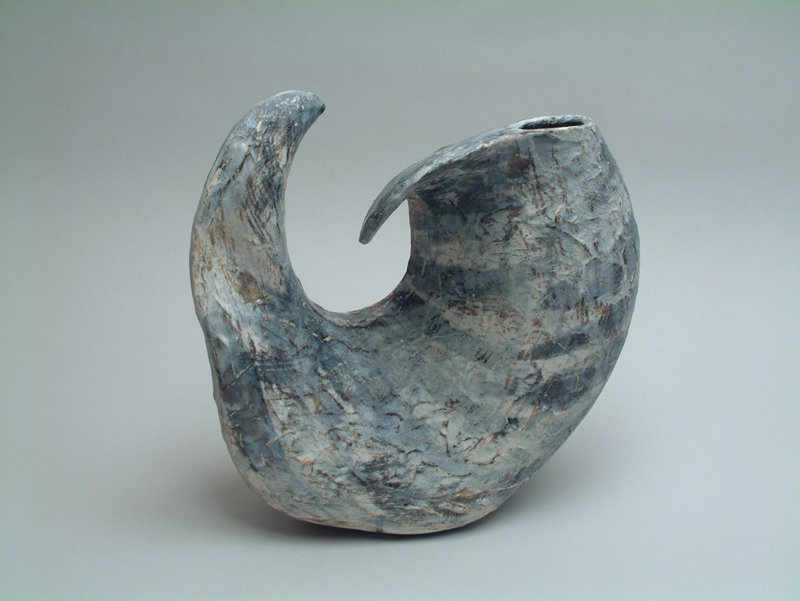 Featured here are a sculptural thrown and assembled Bark vessel; pinched and coiled conical bowl; pinched and coiled tall bottle. 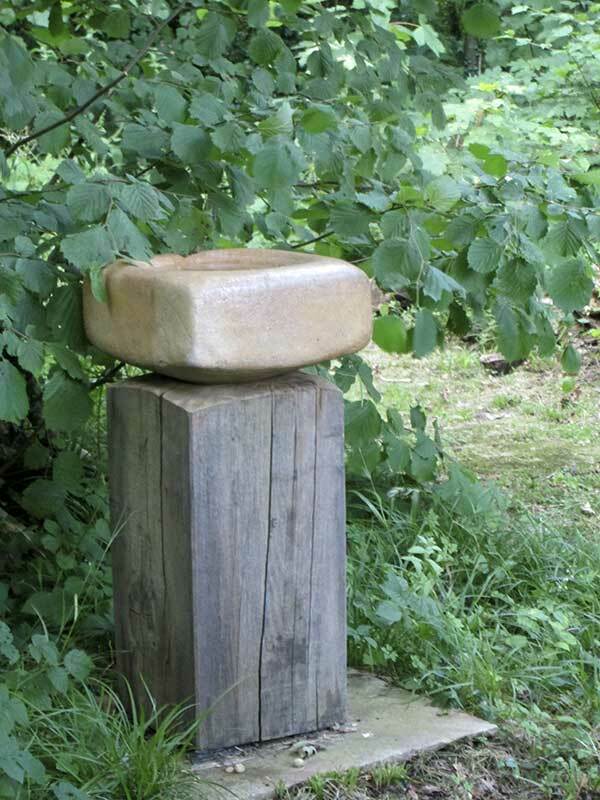 Moving to rural Somerset has given me an opportunity to enjoy and respond to the landscape that surrounds my studio. The forms and textures around me feed my passion for the tactile qualities of clay and allow me to play, creating forms responding to the landscape. This, with life drawing has given me the chance to explore textures, slips and glazes in a new direction of my work. 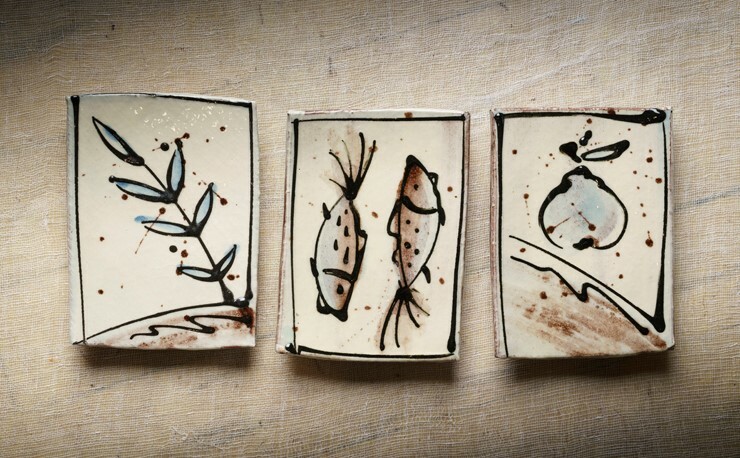 I use stoneware and porcelain clay, texturing the surfaces and use slips and underglaze colours to decorate and high fire the pieces in an electric kiln.